I have made reference to “the Transition.” Before trying to describe its essence, it will be useful to first review aspects of the Transition, in other words, some of its identifiable characteristics. One aspect that runs through all of the others is acceleration, as you will see. The data for this chart was assembled from a straightforward query of the USGS (US Geological Survey) database at their Global Earthquake Search page. And since that post on Feb 2, there have been an 8.0, a 7.0, a 6.4, and a 6.3 in the Solomon Islands, a 6.9 in Japan, and a 6.9 in Columbia. In the Twentieth Century, there was a tsunami with a twenty foot wave height about once every ten years. In this century, it has happened once every two years, resulting in the deaths of a quarter million people despite the fact that none of these tsunamis struck a major city. The NOAA’s database shows that even a tsunami less than five feet in height can kill thousands. With 23% of the world’s people living in what is called the “near coastal zone,” tsunamis are likely the single most life-threatening Earth-change phenomenon on the planet. So, their list is all from the Pacific Rim and Italy. According to some who track this carefully, after a total of 77 volcanic eruptive events for all of the year 2012, there were 44 volcanic eruptive events recorded just in the month of January 2013. Does anyone on the planet need to be told that storms are ramping up in size, intensity, and frequency, resulting in unprecedented flooding? And that heat waves have taken on new intensities and duration? Is there anyone still claiming, “It’s just the internet, nothing has changed, we just have better reporting.”? Anyone making such claims would be well-advised to review the recent history of the global insurance industry. 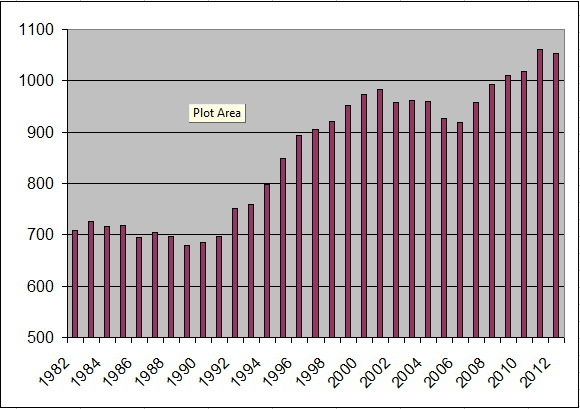 The venerable Lloyd’s of London almost went bankrupt in the mid-1990’s after 350 years of annual profits. They said they had to completely revamp their weather catastrophe calculations because the actuarial data on which they had relied for 300 years (!) was no longer applicable. Heavy rain and flash floods are affecting not only people living close to rivers but also those who live well away from traditionally flood-prone areas. 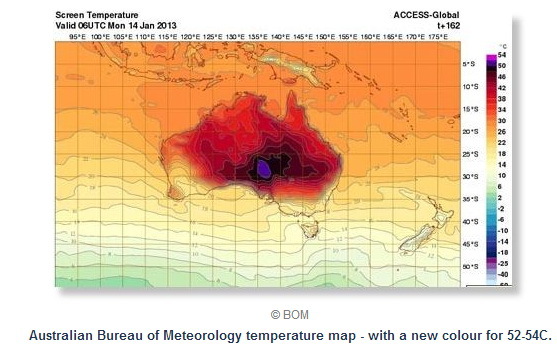 The temperature forecast for next Monday by Australia’s Bureau of Meteorology is so unprecedented – over 52C – that it has had to add a new colour to the top of its scale, a suitably incandescent purple. To give you an idea how rare tornadoes are in Italy, four tornadoes in total were recorded in the 17th, 18th and 19th centuries, three were recorded in the 20th century and four were recorded since 2008 alone, with two of those coming in 2012. “We have left our coasts sitting ducks, and Sandy destroyed these natural protections,” she said. In the space of a few hours, Sandy blew through the sand dunes that had served as natural protections for communities up and down the Atlantic coast. “Basically these dunes build up over geologic time, and yet the superstorm wore them down over a couple of days, and it is going to take geologic time again to build them back up,” McNutt said. The November installment includes Superstorm Sandy. Since the news media typically won’t cover a weather story unless there is a body count to report, few are aware that Lower Manhattan in New York City is still seriously impaired, with skyscrapers running from emergency generators on the street because their basements are still flooded. Part 2 describes a huge weather shift taking place on the planet that almost no one is talking about! This entry was posted in Transition and tagged cyclone, earthquakes, flooding, floods, hurricane, shift, storms, the shift, Transition, trends, tsunamis, volcanism, volcanoes by Thundering Heard. Bookmark the permalink. Absolutely important to share this information, this knowledge! Grateful for the work you have done on compiling it!